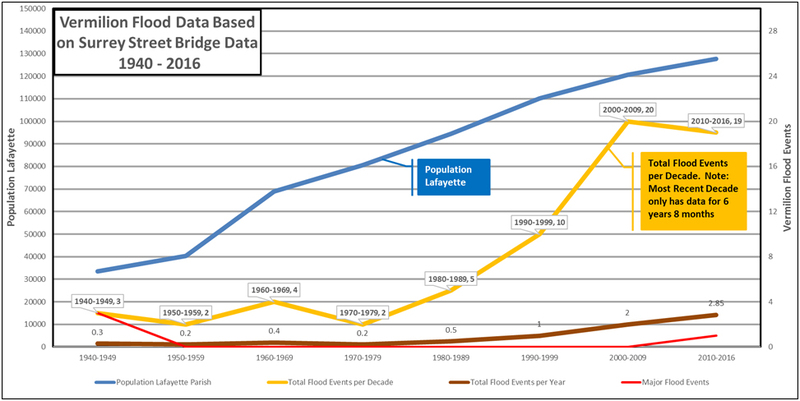 The recent catastrophic flooding in Louisiana, and in particular in Acadiana, along with Harold Schoeffler’s excellent newspaper article published after the flood led me to researching the flooding frequency of the Vermilion river. Additionally, my personal observations after living across the street from the Vermilion river for the last 20 years added to my suspicion that the flooding frequency is increasing. 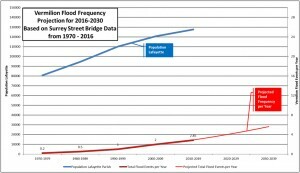 What I discovered confirmed my suspicion that the flooding frequency of the Vermilion river is, in fact- dramatically increasing. 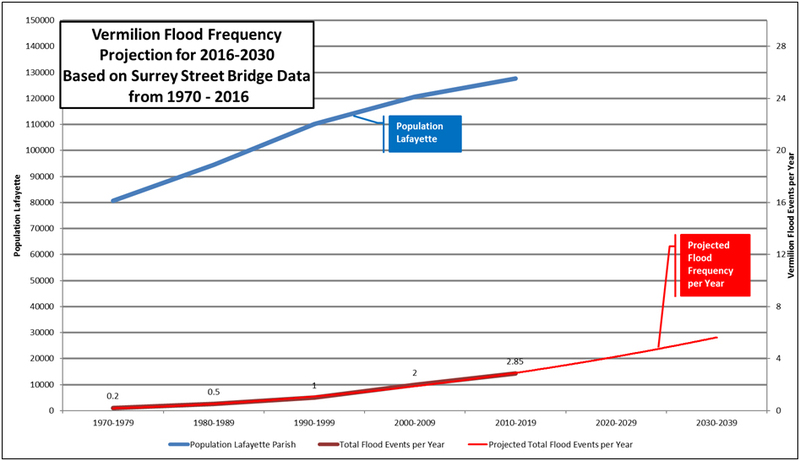 Using the historical data available for the Vermilion river Surrey Street gauge, which includes a table of past flooding events, I calculated and plotted the total flood events per decade as well as calculated the average number of flood events per year. I discovered that in the decades between 1980-2016 the number of flood events started increasing at a rate roughly doubling every 10 years. During the decades between 1940 and 1980 the Vermilion river flooded once approximately every 4 years. In the decade of 80’s the frequency increased to once every 2 years. In the decade of the 90’s the frequency increased again to once per year and in the decade of the 2000’s increased to twice a year. In the most recent decade the Vermilion river is flooding 2.85 times a year! After discovering this information, I decided to add a projection for the number of floods per year based on the historical flood data. 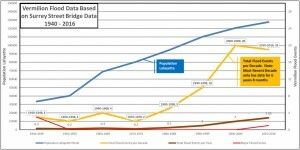 The projection uses a standard mathematical “best fit” line to estimate flooding frequency in future decades. The projection estimates that the river will be flooding approximately 6 times a year in the decade of the 30’s if nothing is done to remediate the situation. Obviously something must be done to fix this problem and this fix needs to be implemented quickly based on the current data and this projection of future flooding events. With an increasing Vermilion river flood frequency this reality obviously increases the probability of another major flood in the future. On Sept 6th there was an Acadiana regional meeting of governmental officials, water shed district executives, the US Army Corps of Engineers, and interested private citizens. This excellent kickoff meeting was organized and conducted by Guy Cormier Parish President of St. Martin parish. At the meeting governmental officials reported preliminary flooding estimates of greater than 12,000 private homes impacted along with numerous business operations disrupted. There seemed to be a consensus at the meeting that any solution needs to be a regional solution to avoid undesirable effects to downstream communities. There was also an agreement that this meeting was only the first regional meeting regarding this matter and monthly subsequent meetings will be scheduled. While this meeting is a good start, the citizenry can assist by contacting their local, state, and federal governmental officials letting them know that a solution, and necessary funding to implement the solution, is of highest priority. Unnamed and unmentioned were the thousands, like myself, that were within inches of having their homes and businesses flooded. The reality of currently experiencing nearly 3 floods per year and the projection of up to 6 floods per year in the decade starting 14 years from now should instill a sense of urgency to correct the problem. Now is the time for action. While the current funding focus is for disaster relief and rebuilding we must look to the fact that with dramatically increasing flooding frequency we should be looking at future flood prevention also. Contact your governmental officials. I recommend we start with our federal office holders followed by your state and local officials. Consider this a call for action.